McFarlane Medical supplies a range of optometry equipment that can aid ophthalmologists in delivering effective diagnosis and treatment solutions. Are you in search of new equipment for your clinic or want to replace your existing instruments? We can help you with our great quality optometry machines. We supply market leading innovations featuring both form and heightened functionality. For quality products with precision accuracy in diagnosis and treatment, look no further. 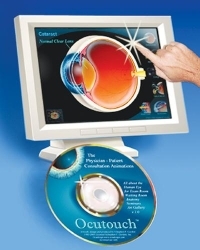 At McFarlane, we supply MacuScope to measure macular protective pigment density, mobile cases for MacuScope, and Ocutouch interactive instructional CD ROM. All products are designed to make the optometry treatment options effective and hassle-free. We offer premium products at competitive prices and provide a holistic after-sales service. Discover our range of high performing machines and equipment, developed to offer your patients state-of-the-art technology and function. Learn more about our optometry equipment range from our team of professionals.